Come relax in our family home. Freshly renovated, clean and tidy. Perfect for starting the day off with a morning coffee and breakfast on the deck, then stroll down to the beach with your surf board, umbrella and magazine till lunch. An afternoon siesta then a beer or wine on the sun drenched decks for an evening BBQ with friends and family. House fully fenced and safe with a good trampoline and swing set, slide, and gymnastic rings for the kids. Large Bayfair mall, parks, skate park, takeaways, dairy and medical centres within a short walk. Much loved family home with indoor chalk wall, kids toys, large laundry area, and open plan living. Popular Cafes a longer walk or short car ride, and a 7km drive along the beachfront to Mount Maunganui itself for gorgeous walks, hot pools and delicious ice creams. This house is central to everything, so also a 5km drive to Papamoa Domain. Kids are easily entertained at nearby bay wave pools and Bayfair mall on those rainy days too! We love this house and feel lucky to be raising our family here. Cant wait for you to enjoy it too. Outdoor shower for when you return from the beach-plumbed hot. Since this is our family home we ask you respect our property. House is best suited to families and professionals. Indoor outdoor flow-Comfortable entertaining both inside and outside. Two couches and bean bag. One couch folds out to bed. Well looked after house, close to everything you need.. beach 2 minute walk, shops just down the road. Away from the madness the mt can have over Xmas although only a quick drive if you want get in there. Ruth was lovely to deal with. I would definitely stay there again. We thoroughly enjoyed our stay. 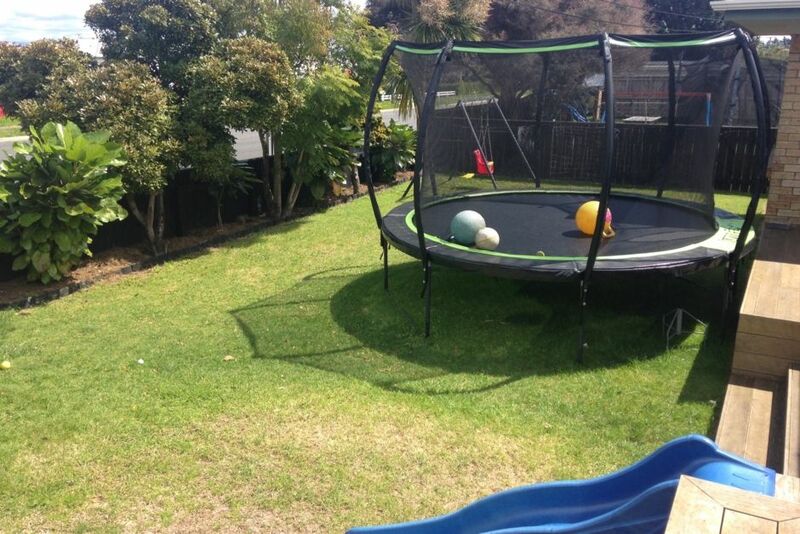 House is comfortable, well equipped and kids loved the outdoor space and trampoline. Short walk to beach, and close to other amenities made for an easy beach holiday. Awesome location for beach, and all facilities we needed for a family of 3 kids. Awesome location for beach, and all facilities we needed for a family of 3 kids. Tidy house and we will definitely be back! Very family friendly property - perfect for what we needed. It was in the process of being renovated, but it was very well situated near the ocean, and very child-proof, child friendly, very practical and cool.